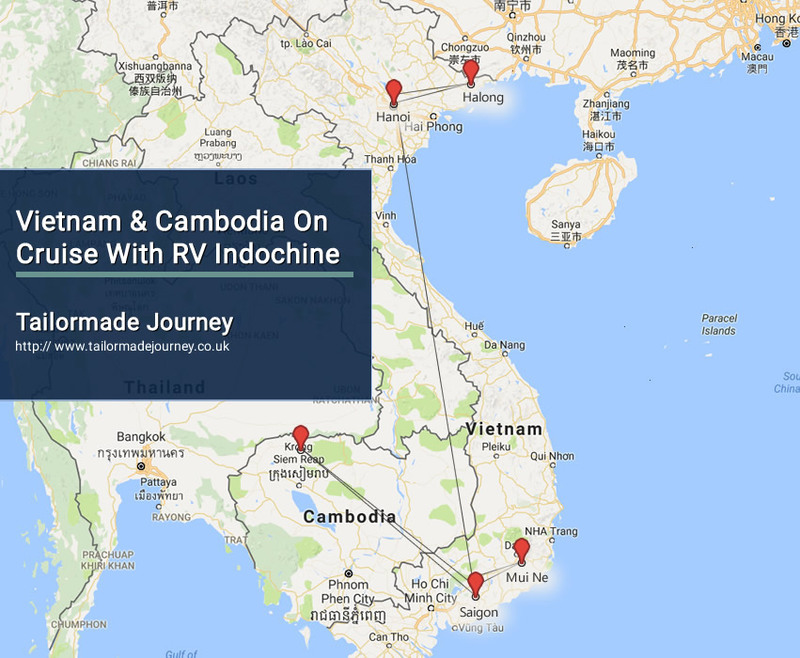 Get indepth into Mekong river life by staying 7 nights on RV Indochine luxury cruise. Extension to Halong Bay UNESCO World Heritage and Mui Ne the beach resort capital of Vietnam. We arrive in Ho Chi Minh City. Built by the French in 1859, at the beginning of the colonial era, the town has retained some of its French atmosphere which characterises it. After lunch in a local restaurant, in the afternoon we have a tour of the city: Reunification palace, Notre Dame cathedral and Central Post office. We board our ship and then have a welcome cocktail and dinner. Overnight on board in Ho Chi Minh City. Overnight Stay on Mekong cruise. After breakfast, we devote our morning to visiting Cholon, whose name means “Great market”, a district crawling with people, where almost half the population of the city lives and where trade reigns supreme. We visit the market and the Thien Hau Pagoda, dedicated to the Goddess of the Sea. We have lunch onboard before our afternoon visit of the National History museum then a visit to a lacquer-ware factory. We return on board and set sail for the navigation channel of Chao Gao. Dinner and overnight on board and we drop anchor and moor for the night at Nha Be. Very early this morning, we continue our cruise to My Tho along the magnificent Chao Gao Canal, which passes from the Saigon River to the Mekong Delta. The Delta is made up of four main arms and thousands of canals, both large and small. We have breakfast as we arrive in My Tho. The town is named after the river My Tho which means “beautiful reed”, and it is peaceful and prosperous. Known for its many vegetable gardens, and its fruit orchards, the climate here is hot and pleasant all year long. The surrounding countryside includes one of the most luxuriant gardens in Vietnam with coconut, banana mango and longan trees. We visit My Tho islands in small boats. Along the maze that makes up the network of small canals, pretty country villages appear and we see the local craftsmen at work. We return on board for lunch and continue our cruise to Vinh Long, and Caï Be. The town is located in the middle of the delta region, between two arms of the Mekong. We set off in small boats through the arroyos and gardens which lead to Caï Be’s colniale church. Vinh Long, a land made rich by alluvium, is the country of mandarins and oranges. All of life is organised around the water and we see houses built on stilts and hundreds of small boats that crisscross in all directions. We then set sail for Sac Dec. Dinner and overnight stop at our mooring point. Early this morning we visit Sa Dec, famous for its horticulture and known as the “Garden of the Cochin Chine” in colonial times. We have a tour of the small town where a few colonial mansions are still in existence. Discover the local market and visit the former dwelling place of Huynh Thuy Le, former lover of the French novelist Marguerite Duras who spent part of her childhood in Sa Dec. We return on board for a hearty breakfast and continue our cruise to Chau Doc, a town at the border between Cambodia and Vietnam which became part of Vietnamese territory some 300 years ago. We have lunch on board and arrive in Chau Doc in the early afternoon. Situated in the heart of a gigantic grid of rice fields, the city of Chau Doc embraces both banks of the Mekong and the floating farms overspill into the waters. Chau Doc is a very prosperous town which developed around fishing and farming. Inside the town, a few colonial buildings with their old fashioned charm still remain. The market which surrounds them is the vibrant heart of the city and a multitude of colours. Transfer by small boat to visit a Cham village, a village of silk weavers and fish farms. Dinner and overnight stop in Chau Doc. Mekong cruise leaves at the break of dawn for Vinh Xuong (Vietnamese border). Breakfast is served. We arrive at the Vinh Xuong check-point. We depart for Phnom Penh. Lunch is served. We arrive in Phnom Penh, the capital city of Cambodia. Guests are free to explore this erstwhile Paris of the East. Breakfast is served. We visit the Royal Palace, Silver Pagoda and Russian Market. We return to the Toum Tiou. Lunch is served on board. It is now free and easy leisure time. We suggest that you visit the notorious Toul Sleng torture centre. We return to Toum Tiou. Be entertained by the graceful dancers of the traditional APSARA” show whilst you enjoy dinner. We set sail early morning, have breakfast on board before we visit Koh Chen, a small village where the inhabitants are experts in silverwork and copper work. Here are made the ornaments and decorations used during traditional ceremonies in the pagoda or for weddings. Visit the private school of Mr. Thom Umson, a bright French teacher. We have lunch on board and arrive in Kampong Tralach to visit the beautiful Vihara of the Wat Kampong Tralach Leu Pagoda. We cross through the village of Kampong Tralach by oxcart to reach the pagoda on a small path running perpendicular to the river amidst a magnificent landscape of rice fields. The Vihara dates back to the beginning of last century and has many magnificent wall paintings which are starting to suffer from the effects of time. Completely isolated in the middle of the rice fields, the pagoda is quite unassuming and does not receive many visitors, so its isolation makes it a truly magnificent spot. We return on board and continue our cruise to Kampong Chhnang. Dinner and overnight stop. We have breakfast on board and then visit Kampong Chhnang. Located some 90km from Phnom Penh, the town of Kampong Chhnang is one of the largest fishing ports on the Tonle Sap. Here they also have many fish farms. The region is best known for its fine traditional pottery which is a major source of revenue for the entire country, and the region’s very name Kampong Chhnang means “the port of the pottery” in Khmer. We visit a traditional grove of palm trees and taste some palm sugar before a visit to a traditional pottery. Next we visit a floating village using small local boats. All the buildings here are afloat – the school, the shops and so on, and life develops along the canal network. We return on board for lunch then continue our cruise to lake Tonle Sap, the largest freshwater lake in southeast Asia which forms the heart of the hydraulic system of the Mekong. Cocktail and gala dinner tonight. Overnight stop.